This birth injury claim was filed in Baltimore City against Harbor Hospital and three OBs after a delayed C-section caused a baby to suffer permanent birth injuries, including cerebral palsy. It was filed in Health Claims Arbitration on March 5, 2018, and it is the 104th medical malpractice case filed in Maryland this year. A woman went to Harbor Hospital for a routine stress test (NST) while she was 31 weeks pregnant. The NST was reassuring, showing a healthy fetal heart rate and no contractions. The woman was discharged but returned to the hospital four days later complaining of pregnancy-induced hypertension. Her blood pressure, which had been normal during the NST, was elevated at 184/84. The woman's heart rate continued to rise the next day, even after she was administered blood pressure control medication. The baby's heart rate was not continuously monitored throughout this time, but the fetal heart strips that do exist appear to be normal. After three days of an elevated maternal heart rate, the results of the fetal monitoring strip declined. The woman was administered oxygen and fluids and her doctor diagnosed her with severe preeclampsia. The only cure for this dangerous complication is to deliver the baby. The key is for the doctors and nurses to use reasonable care to best manage the problem. Given the concerning fetal monitoring strip, the woman was sent to the fetal assessment center. The results of a biophysical profile came back normal, but two hours later, the baby's heart rate dropped dramatically for approximately eight minutes. 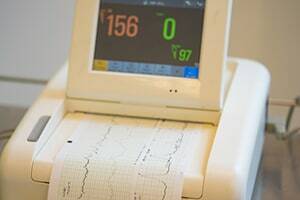 After this prolonged deceleration, the fetal heart rate rose to a baseline of approximately 180 - a high enough heart rate to be classified as fetal tachycardia. A physician came to evaluate the woman forty minutes later. Eventually, more than six hours after the baby started showing signs of distress, the decision was made to proceed with a C-section delivery. The baby was born bradycardic (an abnormally slow heart rate). Her APGARS were four at one minute of life and eight at five minutes of life. The placenta showed signs of a recent hemorrhage and inflammation due to a bacterial infection, most commonly associated with prolonged labor. After the baby underwent MRI and neurology evaluations, she was diagnosed with a left middle cerebral artery stroke that occurred in utero. The baby experienced seizure activity shortly after birth and she was eventually diagnosed with cerebral palsy. The child and her family filed this lawsuit claiming that her preeclampsia was not properly managed. Specifically, they contend that the standard of care required the doctors and nurses to start magnesium sulfate at the same time they begin betamethasone and for more intensive fetal monitoring. Cerebral palsy is a neurological disorder. It is a tragically common, nonprogressive, nondegenerative developmental disability that is generally characterized by abnormal muscle tone, posture, coordination, and reflexes. Cerebral palsy occurs in about 1 in 500 live births. This results in 8500 new cases of cerebral palsy annually in this country. CP can occur as the result of medical malpractice but also in the absence of malpractice. The majority of children with CP show symptoms of cerebral palsy as infants and toddlers. The diagnosis of cerebral palsy is made before the child is 18 months and the parents typically suspect a problem long before cerebral palsy is diagnosed. High blood pressure is often the first sign of preeclampsia, so blood pressure monitoring is an essential part of prenatal care. A blood pressure above 140/90, documented twice at least four hours apart, is abnormal. Other symptoms of preeclampsia may include excess protein in the urine, headaches, shoulder pain, blurred vision, abdominal pain, nausea, decreased blood platelets, and shortness of breath. Other effects of preeclampsia can include renal effects, creating high protein in the urine. So that is a critical marker for the severity of the condition. There are also effects on maternal liver and liver function and the central nervous system. There can also be bleeding abnormalities. So there's a wide variety of effects that preeclampsia can have. How do you cure preeclampsia? You cannot. The only cure for it is to end the pregnancy. Preeclampsia occurs in as many as 8 percent of pregnancies. So many preeclampsia malpractice cases are the result of obstetricians and nurses responding too causally to the symptoms of a mother or child in distress. According to the claimant's expert witness, a maternal-fetal medicine specialist, the baby's in utero stroke caused all of her injuries and damages. If the baby had been delivered earlier, in accordance with the standards of medical care, she would have avoided the stroke and thus would have avoided brain damage. If the fetus was in real distress six hours before delivery, this is what this case is really about. If a child is in significant fetal distress and nothing is done, that is a bigger issue that than nuances of the severity of the mother preeclampsia. The defendants are going to claim that the preeclampsia timely diagnosed and treated and that the cause of the baby's injuries was the premature birth. There is no dispute that babies born before 37 weeks are at higher risk for cerebral palsy. There are so many classic birth injury threads in this case. Preeclampsia, a delayed C-section, cerebral palsy, bradycardia, and a baby allegedly in distress for many hours without any action to expedite delivery are all classic birth injury lawsuit issues. Failing to obtain appropriate consultations. Failing to react to the positive history, symptoms, signs, physical findings, and other data which indicated a predisposition for preeclampsia. Failing to maintain and follow adequate written policies, procedures, and protocols. Failing to timely start magnesium sulfate. Failing to maintain continuous fetal monitoring. Failing to appropriately evaluate and interpret the fetal monitoring strip. Failing to diagnose and treat preeclampsia in a timely manner. Failing to timely deliver the baby. As a direct result of the defendants' negligence, the baby suffered a permanent brain injury, causing seizures, developmental delay, cerebral palsy, physical and mental impairment, tone abnormalities, spasticity, and neurological disabilities. The child is and will be permanently dependent upon others for her care, she will require myriad future medical procedures, and her future earning capacity has been severely diminished. Read more about cerebral palsy and fetal monitoring birth injuries. Take a look at additional medical malpractice claims involving Harbor Hospital. How much is a cerebral palsy case worth?